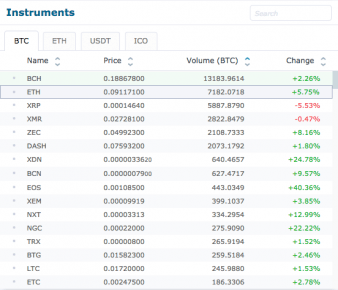 BEWARE: The exchange has come under scrutiny for disabling withdrawals on January 2, 2019, few days before the annual Proof of Keys event, thus raising suspicion of the community. No comments have been issued on behalf of the exchange so far. 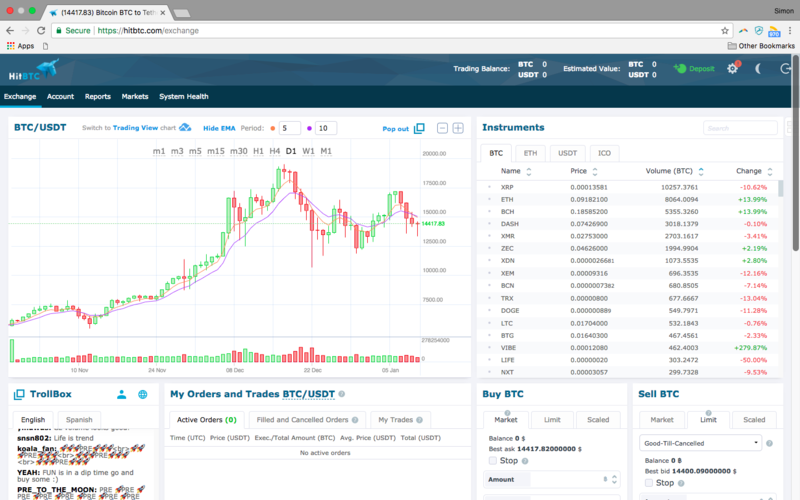 HitBTC is an exchange for the experienced cryptocurrency trader. It focuses more on trades in paired cryptocurrencies than on buying, say, bitcoin or litecoin with euros or dollars. Yet despite its initially dizzying layout of graphs and tables, its basic workings make it easy to use. Its harnessing of two-factor authentication also makes it a secure exchange, while the ability to trade between a pair of currencies can help users make bigger gains than usual. However, question marks are surrounding its ownership and whereabouts, which aren’t currently clear. There are also reports from forums regarding reliability, with some users having difficulties withdrawing their funds. 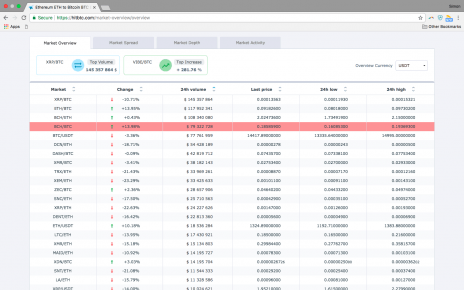 There are also exchange fees for trading (i.e. buying) one currency with another, although in this case the fee is 0.1% of the total amount being paid by the buyer. 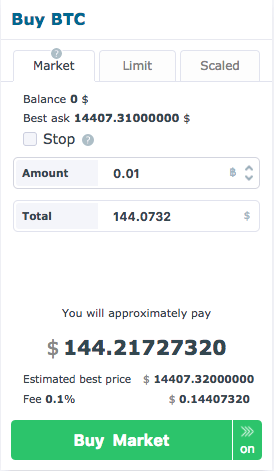 For instance, if the user wishes to buy 0.01 BTC with tether (USDT), they will pay 144.0732 USDT for the total amount of bitcoin. 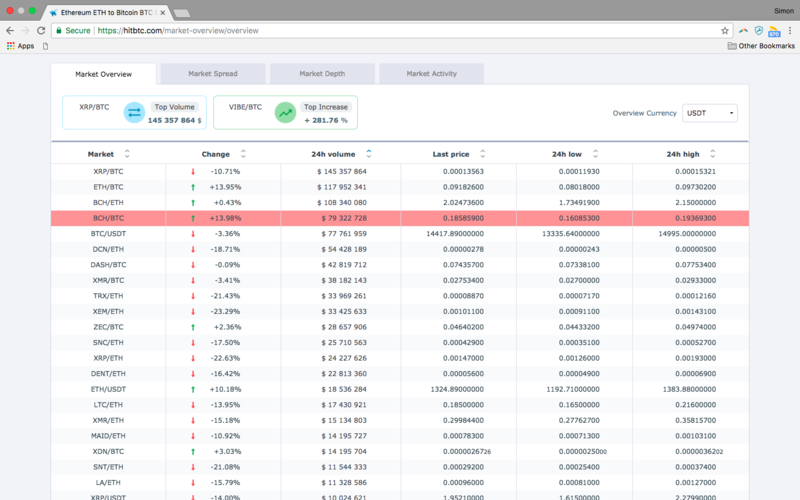 And as the image below shows, they’ll also pay 0.14407320 USDT in commission to HitBTC. 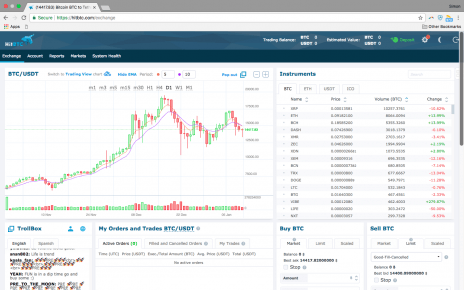 Launched to the public in February 2014, HitBTC is an advanced exchange specialising in paired cryptocurrency trades. It exchanges a wide variety of digital currencies, including bitcoin, ethereum, litecoin, dogecoin, monero, dash, and USDT (tether). It’s also one of the few exchanges open to bots, providing a range of APIs that help tech-savvy customers trade automatically. Yet despite its appeal as a more specialised crypto-exchange, some customers have complained online that they’ve been unable to withdraw their funds. There’s also the fact that its former, London-based parent company – Hit Techs Ltd. – was dissolved in May 2017, with there being no record of where the exchange is now based. This raises questions as to its reliability. 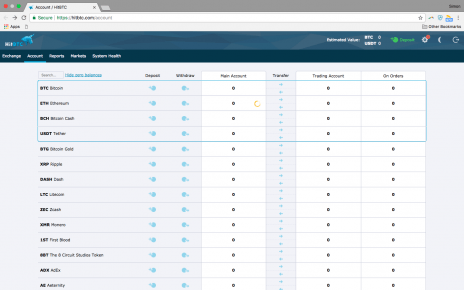 HitBTC does security well. For one, it lets users set up two-factor authentication for all their transactions, adding an extra layer of safety. The Security section of the Settings menu also allows the user to see all logins to their account, so that they can check to see if there’s an IP address and/or location they don’t recognise. And just in case someone else happens to be logged into their account, they can click a button which terminates all sessions except theirs, while they can also choose to automatically logout of all sessions at a chosen, regular interval. 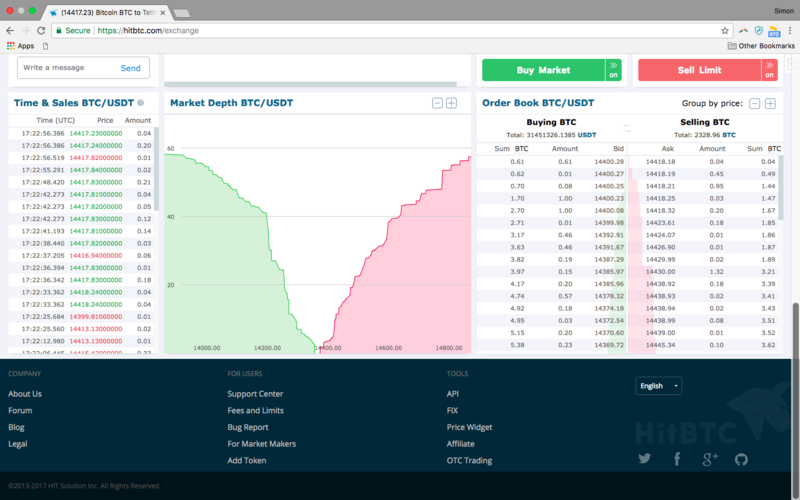 Given this complexity, it might not be surprising to hear that HitBTC doesn’t offer a mobile app. That said, the actual mechanics of how the site works and how a user trades are surprisingly straightforward. Users complete trades by making a deposit of a chosen cryptocurrency into the wallet HitBTC provides them for it, using the deposited cryptocurrency to buy other currencies, and so on, until they withdraw their gains to an external wallet. 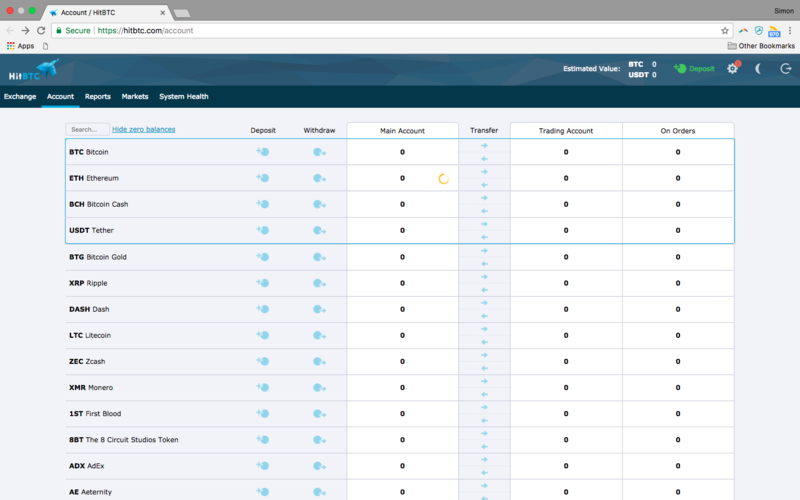 With a “General”, unverified account, users can’t buy any cryptocurrency directly from HitBTC using a fiat currency such as euros, pounds, or US dollars. Instead, users deposit a particular cryptocurrency by having HitBTC generate a wallet for it, and then by transferring the cryptocurrency to it from a “third-party” (i.e. 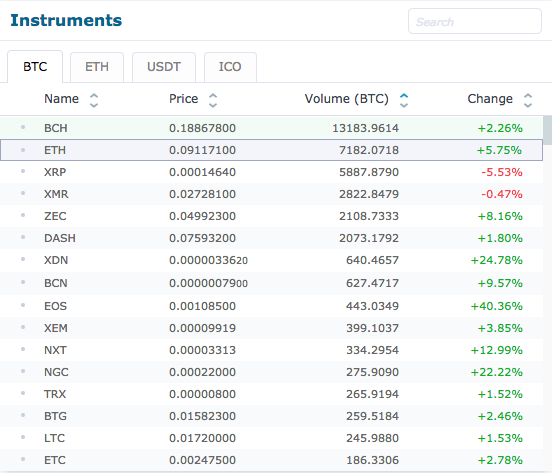 another crypto-exchange). Similarly, to withdraw a particular cryptocurrency, users need to withdraw to a wallet for that currency they have with another exchange.